Back Volume Back Vols. are available. 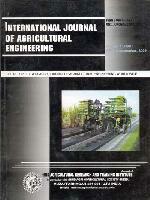 The National Academy of Agricultural Sciences (NAAS), had rated this journal with a mark of 3.6 on a scale of 1 to 10.